N.V. 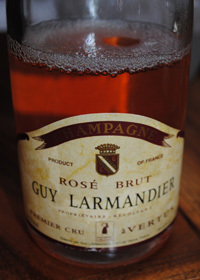 Guy Larmandier, Brut Rose, Premier Cru Champagne, a Vertus, France. The latest disgorgment of Larmandier’s Premier Cru Brut Rose Champagne is a beauty, this is going to leave a lasting and profound craving, yes sir, I really recommend grabbing some of this rare and lovely bubbly while you can, and I’m not kidding, you better get more than one. This addictive sparkler shows pure elegance, life and class from start to finish with a magical array of classic Champagne character and flavors with a bright soft mousse, brioche notes, strawberry and cherry fruit, yeasty and nutty with racy citrus and heavenly mouth feel. There is richness on the palate, but it still is bright, fresh and dreamy, highlighting Guy Larmandier house style and impressive nature of this glorious Rose. I adore this artisan Champagne and it offers loads of unique charm and still comes in at a much better value than the Grand Marques.